Did you know that 56% of microwave ovens used for more that 2 years can possibly leak levels of radiation 10% higher than the safety standard of 5mW/cm2 regulated by the FDA and EPA. Microwave radiation is odorless and invisible, its leaks can be caused by slamming the oven door, leaving food particles in the hinges or seals and moving the oven around etc. 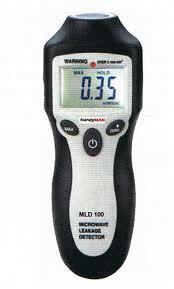 We use a HandyMan MLD 100 Microwave Leakage Detector to complete the test.